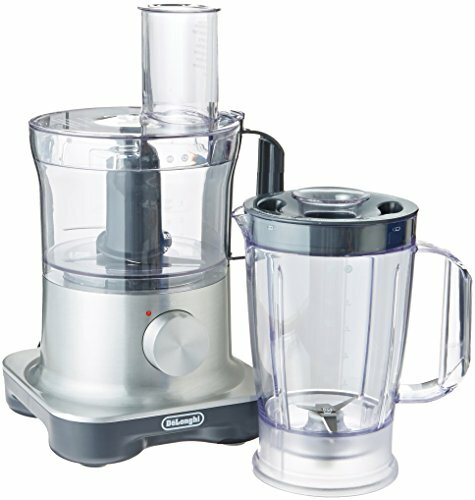 Finding the best blender food processor combo can be a bit tricky with the wide range of options available. The truth is that the market has been flooded with a lot of blender food processor combos in recent years with increasing popularity of this multifunctional tool. If there is one appliance where there will be a hot debate with it will be multi-use kitchen items. They’ve gotten considerably better over time, and the idea of a blender and food processor combo is not a bad thing at all. Besides being economical it also saves space, and in many cases offers more functions than if they were separate appliances. No one is going to doubt the power of an all in one appliance, especially with an easy to use system and some of the most delicious looking recipes on the planet. There are a ton of infomercials marketing these types of units, and if you walk in any department store there is usually a display showing the newest system available. These types of units aren’t going anywhere, and are here to stay. The main rule of thumb is to try to get a unit that is 700 watts or higher, and if not available, try to get as close to that number as possible. The more powerful the machine, the less of a headache down the road for you. This might not always be possible when trying to balance out the features you want with the power of the machine, so just play it as close to that number as possible. Also don’t focus on accessories, as that is a pitfall that will prevent you from buying a quality machine. Only in situations where purchasing a system like the Magic Bullet is it necessary to focus on accessories. So below is a list of the best blender food processer combos available on the market. 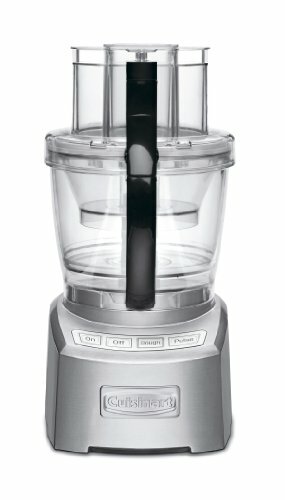 Wattage: 500-watt food processor with 10-cup capacity and wide-mouth feed chute. The Ninja Mega Kitchen System is a 2 horsepower 1500 watt system that destroys the competition with its versatile use of its blades. This is a mid-priced item, with the first of the included accessories being an XL 72 ounce Blender, capable of crushing piles of ice into concentrated smoothie bits. It also includes the XL 8 cup food processing bowl for vegetable chopping and making dough. As if that wasn’t enough, they included 2 Nutri Ninja cups for carry along use, similar to what is found in smaller blenders like the magic bullet. The accessories are BPA free and graded as dishwasher safe for easy cleaning. It has a 3 speed system that also pulses, and can handle just about any task given to it. There is an included 1 year warranty from the manufacturer, even though the unit is built very well and made to last. All cups are of high quality, and the multi blade system can crush just about anything. If looking for more single serving Nutri Ninja cups to add to the system, there may be a problem locating any in store. The internet is going to be the best bet for the consumer, and most notably cheaper than a retail outlet. If you need to shred cheese, you have to purchases a separate accessory for 59.95 called the prep system. This add on as well as others can get expensive in a hurry, and should have been included with the unit. The unit itself is very easy to clean, and one of the more powerful on the list. As far as noise level, it isn’t any louder than the other listed food processors. 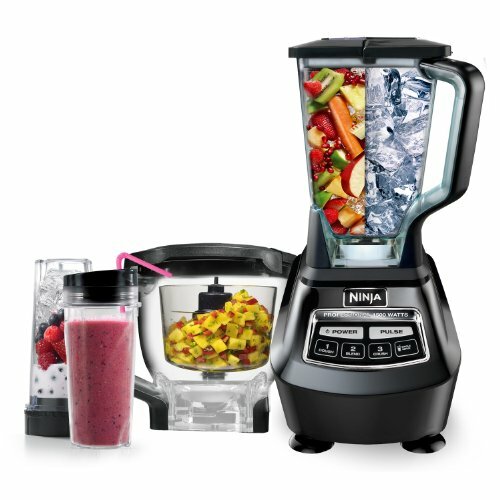 The Ninja Mega Kitchen System is a very versatile food processor combo that with the right purchases can replace most appliances in the kitchen. On the lower tier of the price list is this Black & decker food process and blender, a 500 watt 10 cup capacity unit with a wide mouth feed chute. Previously a dough blade was included with the unit, but they stopped including it with newer versions of this, much to the dismay of the general public. It’s a 3 speed system with soft touch Mylar buttons, and a pretty simple but safe locking system. The base of the entire system is a nice looking stainless steel with suction cup feet and a hidden cord storage. The unit is pretty small, but the suction cup feet may prove to be a hindrance for some kitchen setups. Accessories include a blender jar attachment, chopping blade, and slicing/shredding disk. There is some decent power in this small setup, and it’ll handle a majority of tasks without too much of a hiccup. 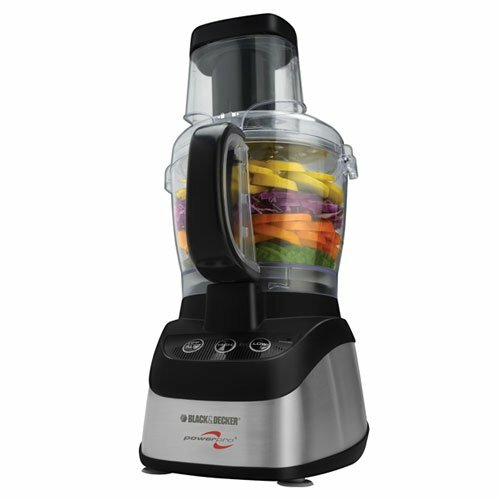 As one of the better looking units on the list, it is a shame that Black & Decker chose to only make the blender glass and the other bowls plastic. This takes away from the nice professional look, and makes the unit look and feel cheap. As many people who have owned this food processor admit, it’s good, but not the best. It won’t blend ice nearly as well as other products on the list, making smoothies and like concoctions a no go. There is a real disconnect in how well this product looks to how well it performs. It will do the job, but there is a lot of room for improvement in all areas mentioned. As a side note, the official website is very easy to navigate and extremely helpful with all of their products. This is the lowest priced item on the list, even lower than the Oster brand. This is very much a budget blender, but one that surprises with 700 watts of power. It also includes a 3 cup chopping bowl, and with its 2 speed plus pulse functionality it is simple enough for any buyer to use. The stainless steel blades used are not at all bad, and decent enough to get the job done for most processes. The wave-action system promises to deliver no ice chunks in the 5 cup glass jar, and the mess-free spout is a nice addition to pour out the contents. The chopper doesn’t seem like an add-on at all, and works just as good as the blending portion. One of the convenient features of this model is the retractable cord, which saves kitchen space and hassle. 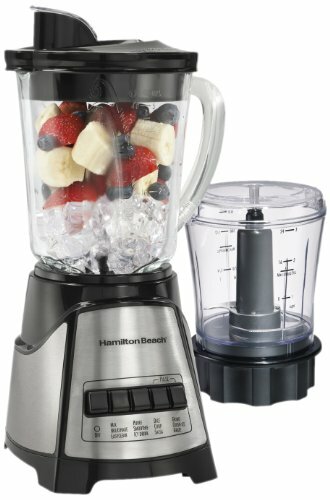 One of the weirder choices in design made Hamilton Beach make the blender jug glass and the food processor attachment plastic. Both are still dishwasher safe, but it is one of the stranger choices with material decisions. The 3 year limited warranty is not as good as it sounds, and is very limited when you read the fine print. Even with 700 watts, the blending blades are not consistent with smoothies or frozen drinks. Ice chunks won’t be a big problem, but the overall smoothness and consistency will be a huge one when adding frozen fruit. The big omission is a safety locking system, meaning the unit will run as long as it’s plugged in. That’s a huge safety hazard, especially in a home full of children. This is a decent unit, but nowhere near one of the best on the list. This is a well-reviewed high priced food processor from Cuisinart that includes several accessories that are sure to be beneficial to any kitchen. The processor is about 1000 watts with 14 work bowls, and a 4 button system. Features include a wide-mouth feed tube and patented blade locking system. This is one of the safer processors to use and clean, although some power will be sacrificed. The slicing disc, shredding disc, and chopping/mixing blades are all made of high quality stainless steel. The included parts are all dishwasher safe, and even after a couple of washes maintain their edge. For the included accessories there is a storage case, and Cuisinart even threw in a spatula and recipe booklet for reference. There are a lot of extras included in this package, and they’re in no way cheap gimmicks. Unique to this product is a retractable cord so that you can avoid clutter in the kitchen, especially if this is always plugged in. This unit is a lot less powerful than say a Ninja unit, which is 1500 horsepower. When chopping certain items, sometimes it can be overkill and it will end up mincing instead. The plastic cover may crack over time, and costs 60 bucks to replace. This is a rare occurrence that shouldn’t happen if the unit is taken care of, but it’s something to be aware of when it happens. This is a very quiet machine, which completely shatters the loud food processor stereotype. Food can sometimes get stuck in the lid, and can be difficult to get out. And unlike other brand names, customer service is a hit or miss for issues, and may frustrate some customers with problems. This is still a very good food processor to have, and is not as underpowered as some might think. This is another low priced food processor, although not exactly on the budget end. 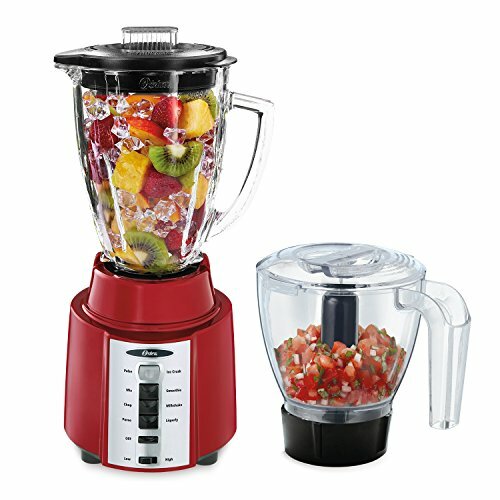 It is a full function food processor with an included 40 ounce blender attachment. It’s a double function machine that allows users to multi-task with the use of its serrated stainless steel chopping blade, dough tool, stainless steel thick slice/shred disc, and stainless steel fine slice/shred disc. The dual drive system takes a lot of the guesswork out of the speeds needed for food processing and blending and does it automatically. The interlocking safety system will prevent any accidents from happening, forcing the unit to shut down if not fully locked in. The 2 speed and pulse settings are a bit limiting, but for the most part get the job done. The blending portion of the machine has a capacity of 5 cups, while the food processor is around the 4 cup mark. The wattage on the motor is only 400, making it one of the weakest on the list. And with only 2 speed settings, it’s extremely limited in functionality, even with the intelligent functionality. It’s compact enough for what it does, but the components are on the quality level of some of the cheaper brands. The noise level is substantial, even though it has one of the weaker processes. On the other side is the blender attachment which seems like an afterthought, and won’t do particularly well with smoothies as a Ninja or even no name brand would, that was meant specifically for that task. If judging the unit just on the food processor portion alone, it gets high marks. That’s something that consumers should keep in mind when eyeing this food processor and getting it solely for the blender attachment. One of the lower priced budget items on the list, the Oster Rapid Blend is a 450 watt unit with 8 speeds. The glass jar is holds about 6 cups and is scratch resistant and thermal shock tested so that it doesn’t respond badly to quick temperature changes on either end. The Included 3 cup processor attachment is BPA-free and dishwasher safe like the main glass jar. With the stainless steel S blade food prep is easy and hassle free for all levels of cooking. It uses a 4 point design to destroy anything you put in the machine, and with Oster’s 10 year all-metal drive limited warranty for lasting durability, customers should be at ease to put the power of the unit to the test. The entire food processor was built with a small space saving design in mind, making it easy to store in any part of the kitchen. Blenders are loud, and this is one of the loudest on the list by far. It also has one of the weakest motors, running at only 450 watts total. Some tasks may be a bit too much for it, or require extending chopping or blending times. It should be noted that the materials are noticeably cheaper with this product than the others, and it is considered to be in the budget line of food processors. The thing to keep in mind with this product is just how limiting it is, and to not overtax it. For what it was made to do, it handles very well and shouldn’t be a problem for most users. If loading it with a ton of things at once, this is where the limitations well be seen. It’s still a good budget blender, and is pretty much sold everywhere. This is the infamous blending system known worldwide by Magic Bullet. The tried and true low priced system is a 15 piece set with a 900 watt motor that works twice as hard as the number it puts on the box. Healthy recipes and ideas are included in the hardcover recipe book, with many more iterations online and in video form. This is the original ‘push the cup in and twist’ design that started it all, and it works just as good as the other copycats. Glass parts are dishwasher safe, and holds up well over repeated use. The 15 piece set includes accessories such as 1 colossal cup, 2 tall cups, 1 short cup, 2 extractor blades, 1 handled lip ring, 1 regular lip ring, 1 flip top to go lid, 2 stay fresh resalable lids, a cookbook, and 1 pocket nutritionist guide. This really is an all in one solution with an incredible list of features. Because of how the blades site, it is vital that users learn how to clean it properly so that they don’t rust. The number 1 failure of this system is due to blade failure due to mishandling. This also does not come with a milling blade, although that can be bought separately. This unit isn’t much of a food processor at all, although the pulse function does a good job, it is as basic a food processor as one can get. The strength in this unit lies in the blending portion, and not chopping. And for those looking to purchase the milling blade, they may end up banging their head against a wall trying to find out where to purchase it. This is still the legendary Magic Bullet, and if you don’t already have one, chances are it won’t be a bad purchase for your kitchen. With a 600 watt motor with die-cast metal housing, this low priced blender and food processor is a lot better than it looks at first glance. The 3 cup food processor attachment has a feed tube and pusher, slicer and shredder disk, and stainless steel chopper blade. High end features include a 4 speed electronic touchpad with blue indicators, with specific high, low, pulse, and ice crush controls. Power saving features such as the standby mode and automatic 2 minute auto stop will prolong the life of the unit and prevent motor burnout. Specific stand outs like the 48 ounce thermal shock resistant borosilicate glass jar makes this a very good buy, even if it is on the low end. They even threw in a recipe book that contains some very interesting combinations. The plastic food container is not BPH free, so that will turn away some consumers at the start. A 3 year warranty that’s been included is very worthwhile, and a lot better than some of the others on the list. The ice crush option more of a gimmick, and is really just the highest speed available. Cheap parts like the add-on food processor break over time or get worn out, but can easily be covered under the warranty. The overall construction of the unit itself, however, is a hit or miss depending on what it’s used for. A trend that seems to happen with these cheaper units is the loudness due to not only the parts, but the construction. This is another incredibly loud unit that won’t win over any fans, and as time goes on and the parts wear down it gets louder. This is still a pretty decent unit for anyone looking for a combo, and for the price it’s really not a bad option. Last on the list is a low priced 500 watt blender with a 3 cup food processor attachment, but amazingly a lot of extra features. There are 7 pre-programmed speeds and a bigger than life on and off switch. There is also a feed tube and pusher, slicing/shredding disc, and chopping blade. Also part of the garden variety of features is a 56 ounce glass jar, LED indicators, and cord storage. Most of the parts are dishwasher safe, although it is recommended to wash by hand. With the multiple modes available to the user, this is one of the most versatile low priced units available. The parts still come out as being cheap and replaceable with repeated use, but they are easy to find and cheap to maintain. The unit is also small enough to be tucked away in the smallest part of the kitchen corner. Unlike units of a similar price on the list that don’t make completely blended smoothies, this sends out a consistency that the user will be proud of every time. There is a bit of a learning curve with all the bits and pieces, and in some cases it is not as straightforward as it could have been. The food processor is also a lot smaller than other models, so there is a limit when using. The safety features will confuse some users if they haven’t thoroughly read the manual. There are reports of the motor burning out over time, but if this unit is taken care of properly then it’s an unlikely rarity. There are better units on the list, but not many at the current price point. This is a good buy for both components, as it does both food processing and blending very well. This high priced model from the same company is a much more powerful version of the previous mega, with a total of 3 horsepower with variable speed. It still maintains the 1500 watts but adds the dual stage blending technology with total crushing and high speed cyclonic technology. To shorten that out, it means it is a powerful food processor that can tackle anything thrown at it. The quality is outstanding on all the accessories, and comes with an XL 8 cup food processing bowl with feed chute lid and disc attachments, and 2 Nutri Ninja cups with sip and seal lids. All items are of the highest quality available from Ninja and made to last for years. For the ambitious cook the set includes a 90 page recipe flipbook, full of delicious recipes and bold ideas to try with the unit. The warranty is 2 years on the unit, and although limited, it is a year longer than some of the other products on the list. This processor can be a bit strict on overfilling, and a certain amount of liquid is required in order to get a worthwhile product. The blades are obviously sharp, but cleaning the unit can be dangerous if the user is not aware of the blades that are also at the top of the blender. It’s still one of the easier to assemble items on the list, and definitely comparable to food processors twice its price. This makes the smoothest smoothies available if blended correctly and for the proper amount of time. The locking lid and canister prevents spillage or any accidents from occurring and is a nice feature to have. This is a really solidly built unit that destroys the competition, even products that are twice its price. Since this is a list of blender and food processor combo, wattages above 700 would be more beneficial, especially to those needing dough mixing functionality. Watts measures just how powerful a unit is, and just how well it will accomplish the tasks you set for it. An underpowered unit can still do what a higher powered unit can, but you run the risk of; burning out the motor, not finishing the process correctly, or dulling out the blade. A dull blade in a processor is one of the worst things you can have, and from that point it is only downhill. Always choose the higher wattage if possible, especially if you know the specific tasks you’ll be using will require a lot of power. The most aggravating thing in a smoothie is an ice chunk, and worse is a smoothie that isn’t consistent. Smoothies that aren’t processed with enough power tend to have a gritty texture that doesn’t sit well on the tongue. And in the case of food processors, not being able to mince correctly because it doesn’t have the correct wattage can mean extra work for you. It’s not completely unheard of to have a low powered unit where the blades get stuck trying to process the food, and the user has to scoop everything out into a big mess. This is important for a variety of reasons, and refers mostly to the speed settings. Nearly every unit has a pulse setting that works the same way. But there are multiple units on the list with over 4 speeds, which is desirable to someone that wants the best from a multi-use blender and food processor. The point of the speeds is to get the desired process out of the way. In the case of the Magic Bullet, there is a big limitation in it. But if you look more closely, the magic Bullet is no more limited than some of the products on the list that only have 3 speed settings. The gold standard is 4 or higher for the best amount of options, and anything below that is not enough for a unit with multiple tasks. There is unfortunately nothing in-between that number, so there is no middle ground to be fought over. It’s either a limited unit, or a high function unit, for all intents and purposes. If looking for the best blender food processor combo, then picking one with 4 or more speed settings is more than expected to get the best deal. Not everyone has an island setup in their kitchen, so for smaller kitchens a lot of the processors on the list won’t cut it. Portable units like the Magic Bullet are the best, and can even be left out without taking up too much space. For smaller kitchens, a unit that is able to be quickly taken out, then quickly put back is a great asset. The Ninja is quite large, but is very easy to put together, disassemble, and then put away again. Not having a lot of complicated or unnecessary parts makes the entire process of using a food processor and blender combo easier for the user, and not such a burden because they are in a small space. Repetition of course helps with this process, but a well-designed unit will be easy whether it sits out all the time or whether it is put away in storage after use. Take great care when choosing a unit that will sit out permanently, especially if it contains a host of add-ons in order to reach its full functionality. Those units in particular can easily add up and start getting bulkier. For the purpose of this article, accessories will not refer to the add-on food processors or blenders, but will refer to additional blades, caps, recipe books, etc. The accessory list when choosing a blender and food processor combo is not nearly as important as the main features of the unit itself. It’s easy to get wrapped up in the extras, which is great, but remember that if the actual machine isn’t that good to begin with then the parts that attach to it or use its functions aren’t going to be any better. There is no saving a bad unit, and in the rare case of units that use the Magic Bullet system, accessories become important only because it is a function of the system itself. Some buyers will find that a food processor on this list will not perform a certain function, like shredding cheese, without buying an add-on piece. This could have been avoided if the original unit already had that option, which goes back to purchasing a unit that does what you want to right out of the box and not focusing on the accessories to make it better. Remember, a processor and blender combo is the foundation, not the accessories. Parts that automatically lock or don’t engage when closed are an important feature in all systems. Besides protecting curious children in the house, it also protects you from accidents. All but one unit has a safety feature to prevent accidental injury, which shows how seriously manufacturers take this part of their unit. Some of the safety features are easy to figure out, while others require reading of the documentation. Although some of the more advanced features can lead to frustration, it’s important to understand that they are there to protect you, the user. And even the most advanced system can’t protect you from the blades that are inside the unit. Whenever trying to clean or reach for something inside where the blades are exposed, remember that they are razor sharp! And there are also units with blades on both the top and bottom, many of which can easily slice a finger open. Staying on top of the safety measures with the equipment will avoid unnecessary injury in the future. There are a lot of great items to choose from our list of the best blender food processor combos, and if carefully selected a buyer will have everything they need for a long time. Some of the more tempting choices may not be what you need, and some of the more budget friendly choices may only serve you partially in the kitchen. There are new and improved functions on several blender food processor combos every day, and with the units getting better they are also getting more powerful. Soon the standard will be 700, and a lot of the more underpowered units will be weeded out. For the time being, they have their place in certain kitchens that need them. A good smoothie with no ice chunks in it is worth a lot of money, and if you don’t believe me, ask a Smoothie King or Starbucks customer. With the option to have that same amount of power at home, customers can take control of what goes into their body, and out of their wallets. The gap is definitely closing from professional appliance in comparison to home appliance, and it may already be there. With the right mindset anyone can be in control of their diet and have all the tools necessary right in front of them, and these blender food processor combos are just the first step.